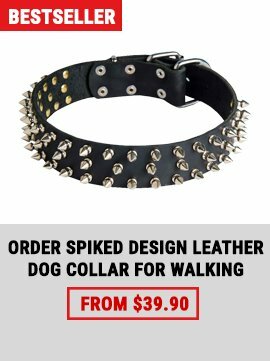 Being furnished by hand with handmade nickel spikes of gold or silver color this harness is referred to as one of the best walking harnesses! 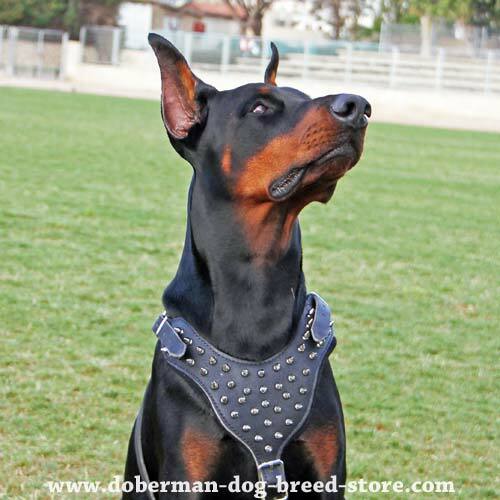 Unique dog harness for Doberman dog breed! It is almost impossible to find a better quality product than this custom walking equipment! 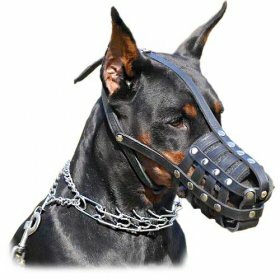 Any awkward harness will not emphasize Doberman’s grand air but will only hide his perfect grace and inborn nobility.This singular top sale device will turn your dog into courageous guardian! The beauty of this decorated gear is indisputable but it is a very comfortable invention by this. 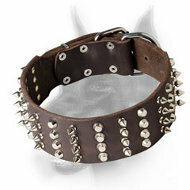 All metal parts, padding made of natural soft felt, leather straps feature one and the same dog article!!! Our highly experienced manufactures were named gold-workers deservedly. 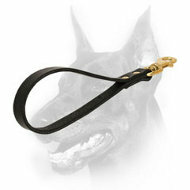 When making every dog product we give a special consideration to its utmost comfort and durability. High quality. Only progressive technology and many years’ experience are the integral parts of best results in manufacturing process! 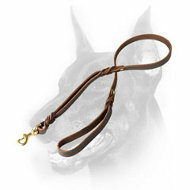 This leather harness was made out of highest quality full grain leather that will stand up various training pressures. 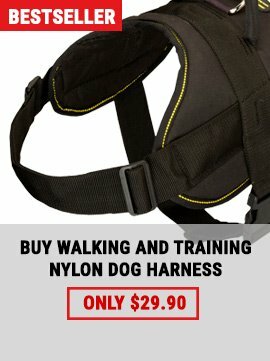 You can buy a less expensive harness at any pet store in your city/town but you will never find the same similar premium quality! 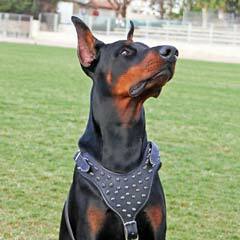 Standards compliance is our standing rule during developing dog gear. Therefore we do not receive any complaints from our customers but only thanks. Neither leathern body nor metal components do contain dangerous elements to damage your dog’s health. Upgraded comfort. 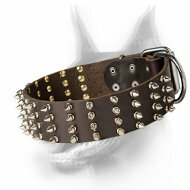 It is truly comfortable model as it will not put your dog to inconvenience when you make him wear it. The reason is select gentle leather that feels soft while wearing. All the straps are wide enough not to wear into the dog’s skin or rub it. 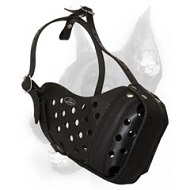 Due to felt thick padding on chest plate and back pad your dog will feel extremely comfortable! This padding will protect him in the long track. The construction allows for full range of motion. Non-problematic adjustment. 4 –way adjustment provides snug fit of the harness! 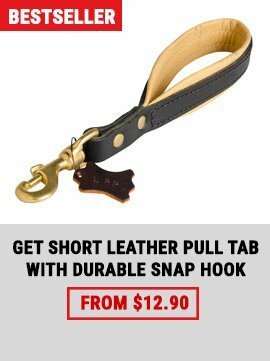 Due to easy regulable straps you will be able to put the harness on and off in seconds. 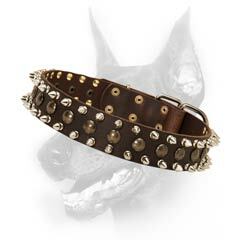 Designed to fit any sized Doberman. When the straps are fully adjusted the harness is not gonna slip off your dog. 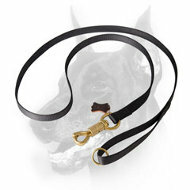 Girth strap has easy quick release buckle for you to manage it by one hand. 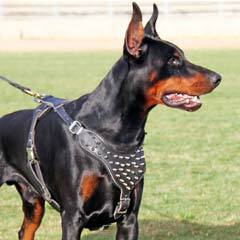 Before buying such dog breed as Doberman you should weigh all pro and contra. For the avoidance of pangs of conscience in future you must reply to the essential question…Do you really need this dog breed? Everything must be paid for in this life so the purchase of Doberman puppy will be followed by a penalty you will have to pay for sure. Have you ever thought that most of your time has to be contributed to education and training of this hyperactive dog?? 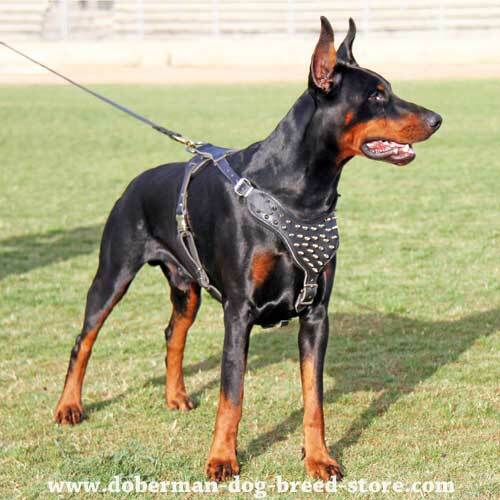 Inconsiderable act is that if purchase of a dog Doberman was motivated by your egocentrism so to say tribute to a fashion.. This dog is very intelligent and requires a lot of care and attention to himself. Your penalty for the thoughtless action consists in regular walk with this dog-mostly several times a day and during number of years. Your individual plans and intentions are secondary in this case. Great responsibility is imposed on everyone risking having Doberman at home. It is not everything by the way…Food is one of the main paragraph to which your attention should be paid in the first instance. It is not plain cheap food but high quality expensive one. You will have to buy it otherwise this dog will make a unhealthy, underdeveloped creature and as a result your expenses will increase..
Doberman. Consequences of having this dog. - READ MORE!